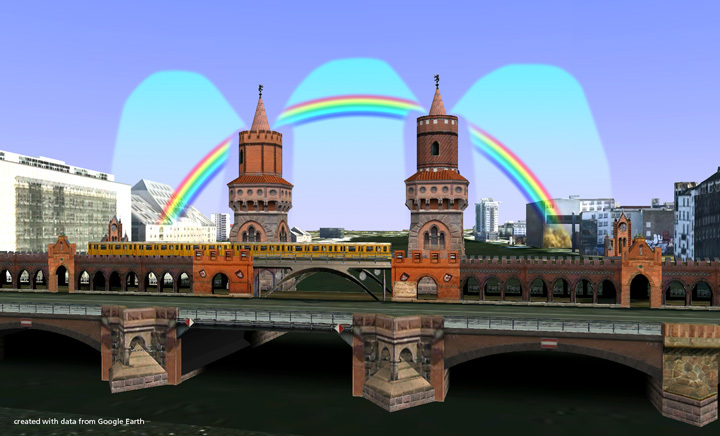 Above the Oberbaum Brigde in Berlin, part of the former East-West-German border – the Berlin Wall crossed it – a real rainbow will appear. This shall be part of festivities celebrating the 120th anniversary of the bridge, which was first opened to the public in 1895. The brigde has since been witnessing the city’s and Europe’s changing history, including two world wars, partial destruction and resurrection and the raise and fall of the Iron Curtain and the Berlin Wall. With the event in Berlin the HELLO RAINBOW! project continues its tour, which started in Jerusalem 2003. It travels to places of recent, past or future conflicts and manifests its simple and universal message, needless of words. From the Berlin installation on visitors and friends of the project are asked to name further places in the world and bring the rainbow there – by any means available to them. All suggestions, comments and documentation of the realized rainbows will be shared on the project’s website.